Jesus Christ, who is a false Christ at the same time, a false God, is the biblical son of perdition being described in 2 Thessalonians 2:3-4, which states: “3 Let no man deceive you by any means: for that day shall not come, except there come a falling away first, and that man of sin be revealed, the son of perdition; 4 Who opposeth and exalteth himself above all that is called God, or that is worshipped; so that he as God sitteth in the temple of God, shewing himself that he is God”(KJV). Jesus Christ is a false Christ considering that the name Jesus did not exist when Christ, who has a Hebrew name that is being pronounced as Yahushua, was born until he was crucified. In short, Jesus is a false name of Christ, Consequently, therefore, Jesus Christ is a false Christ. Secondly, Yeshua, being the alleged Hebrew origin of Greek name Ἰησοῦς (Iēsous) that was finally transliterated to English name Jesus, if directly transliterated to English-that is-without passing through the Greek transliteration or translation, would result to Joshua, not Jesus. Therefore, Jesus is a false name of Christ, being obviously initially originating from a Greek name. Also, if Jesus Christ is a false Christ, the more reason that he is a false God, even assuming that the wrong proposition that “Christ is God“, which is very objectionable because of Hebrews 2:17-18, is correct. Hence, the proposition that Jesus Christ is both a false Christ and false God is logically acceptable. Notice that verse 4 contains the literal descriptions of that man of sin, which descriptions are completely and consistently applicable to Jesus Christ due to the ‘Jesus is God’ doctrine being proliferated by Christians. He is the son of perdition or the son of destruction as described in other bible versions as the name Jesus had destroyed, among others, the narration of truth in the bible. In comparison, the Muslim “Jesus” does not fit into the above descriptions because he is merely believed in Islam as a prophet, not as God. Obviously, then, the ‘Christian Jesus’ is the only entity that is meeting the qualifications in verse 4. Notice also that the phrase “for that day shall not come, except, there come a falling away first, and that a man of sin be revealed” does not imply only that the false Christ will exist only just immediately prior to being revealed. But, it may also imply that he had been in existence about 500 years ago, when the name Jesus started to exist and prior thereto when the Greek name Ἰησοῦς (Iēsous) started. Above theory is supported by the element of ‘falling away first before the revelation’. Previously, instances of similar falling aways by Roman Catholicism were discussed in ‘Christianity in general is a satanic cult‘. Also, based on the personal experiences of the publisher, he realized these facts only after he got away from Christianity, as he was able to learn that Christianity became a satanic cult through the influence of Roman Emperor Constantine the Great that is being sustained by Jesuits. Hence, this revelation. It may logically follow also that Christian believers will only realize these facts if they will get out from fictitious Christianity. The ‘opposeth’ description is exactly manifested in the “I rebuke in Jesus’ name” doctrine, which logically implies the ‘exaltation’ of said name above all that is called God. While God Himself is not directly rebuking a person as a manifestation of His power but would generally inform and forewarn first the person of the effects of violation of His will being legally called today as ‘due process’, behaviorally, this “I rebuke in Jesus’ name’ is an extreme exercise of a power more than that of God. Also, as a result of his being worshipped by Christians as God, he was able to capture the mind and body of believers, which is being described in 1 Corinthians 3:16-17 as the temple of God and to sit therein as God. This enabled him to show to believers that he is God. If you will notice in Exodus 20:18-22, the presence of God is feared by Israleites but because Jesus Christ is less powerful, in fact, he can readily show himself to believers, who are inclined to believe that he is God. It has to be noted that based on records, nobody was revered as God before and at present the same way that reverence to Jesus is being done by Christians. Neither, would there be a possibility that another entity be revered in the future as God just like Jesus. He was or is being revered as God despite the fact that no Jesus name had ever existed when Christ, who has his existing Hebrew name, was born until he was crucified. Based on Hebrews 2:18, if men are capable of sinning, the verse affirms that Christ experienced to have sinned. This is being implied by the verse as it alleges that ‘He Himself has suffered, being tempted’. This is specifically true when he was not yet spiritually informed that he is the messiah. Also, based on the same verse, obviously, the purpose of his conversion to a man is for him to be able to aid those who are tempted, which is less possible, if he is pure. In short, he is a complete man, not God. 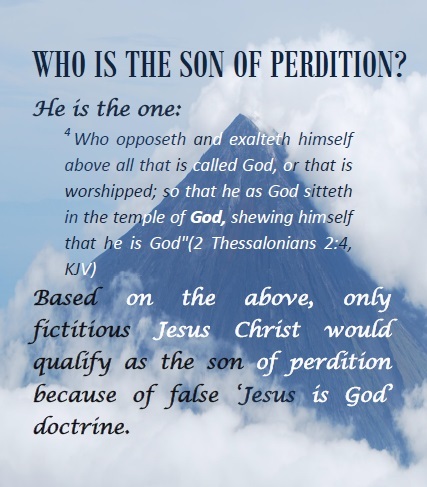 Based on the foregoing premises therefore, Jesus is the son of perdition or the son of destruction, being described in 2 Thessalonians 2:3-4, as he is not God and neither, is he the true Christ. In short, it is very dangerous to believe in Jesus Christ as he is not the Son of God but actually the son of perdition. By aaphil in Religious Deception on March 20, 2015 . I’m in agreement with Jesus being a false God, I’ve even thought that the two men on the white horse was one the the same person; Did not Jesus in history; came in the form of Christianity, conquering the world and killing those who would not conform? And I saw, and behold a white horse: and he that sat on him had a bow; and a crown was given unto him: and he went forth conquering, and to conquer. Revelation 6:2 The men on the White Horse, (Jesus) went fort conquering and conquer; crowned as King of Kings of Kings and Lord of Lords. The man on the white horse in Revelation 6:2 (“anti-Christ”), and Revelation 19: 11, is the same person. Was not Jesus/Christianity/The Pope; used as the vehicle to conquer the world and its people, only later to be used in a peaceable manner? The world was first taken over and its indigenous people we’re force to become Christians or die! A new method of conversion was used in later years, hence the love of Christ became the new means of conversion. Bow is a symbol of man’s swelling words of deceit: The bow is a symbol of victory ( Psalms 7:12 ). It denotes also falsehood, deceit ( Psalms 64:3 Psalms 64:4 ; Hosea 7:16 ; Jeremiah 9:3 ). Example: “they sharpen their tongues like swords and aim cruel words like deadly arrows” (bow). Psalm 64:3 “They make ready their tongue like a bow, to shoot lies; it is not by truth that they triumph in the land. They go from one sin to another; they do not acknowledge me,” declares the LORD. Jeremiah 9:3 1. The old Testament says only the Creator is our savoir and he shares he’s glory with no one. 2. The church leaders says the OT, doesn’t apply to Christian, so no one will study OT commandments and how most of what the NT says contradicts OT laws. Hence the whole world is deceived, into believing, that Jesus is God.